Who were the Nazi gas chamber engineers? The Germans are noted for having the best engineers in the world. The products that they designed are usually named after the engineer, for example, the Porsche car which is named after Herr Ferdinand Porsche. But who were the engineers who designed the gas chambers that killed millions of Jews in the Holocaust? And why weren’t the various designs of these homicidal gas chambers named after them? I started thinking about this today when I got an e-mail from someone who directed me to an article by Nele Abels on this page of the Nizkor web site. The article describes the design of the Mauthausen gas chamber in great detail. In fall 1941 a gassing chamber was built in the main camp Mauthausen. 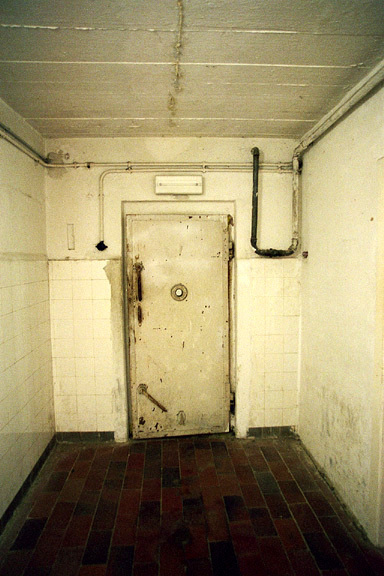 This was a room in the basement of the sick bay, without windows, 3.80 m. long and 3.5m. wide, which was disguised as a shower-bath. It was tiled, equipped with a ventilation device and air-tight doors. All switches for the electrical illumination, for the ventilation, for the water and for the heating were outside the gassing chamber. The tube was installed parallel to the wall in the gassing chamber and had an estimately (sic) 1 m. long slit on the wall side. When the camp was freed in May 1945 the American troops got hold of the device which was used to introduce the gas into the gassing chamber. A photograph of this device can be found in the National Archives in Washington. The main part of the device is a sturdy metal box which measures roughly 75 x 40 cm. The removable insulated lid of the metal box can be shut airtight with heavy wing bolts. Inside the box several open cans of Zyklon B can be stored safely as well as a hot brick used for accelerating the evaporation of the prussic acid. To both sides of the box valves are welded. On one side an electric ventilator can be attached, on the other side a hose leading to the enamel tube described above. Wow! This is truly an example of German engineering! The Mauthausen gas chamber used a hot brick to accelerate the evaporation of the prussic acid in the Zyklon-B pellets which were used to gas the prisoners. 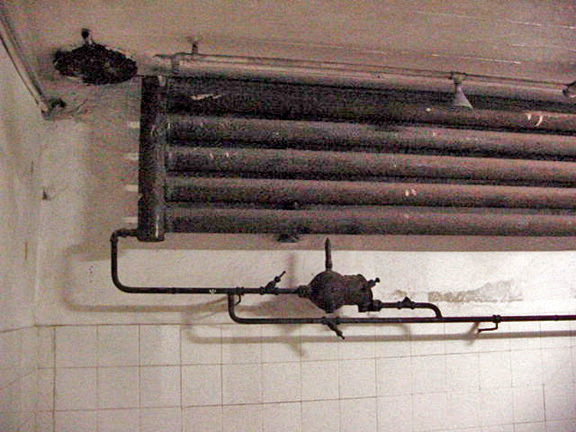 Some of the Nazi gas chambers lacked a way to heat the Zyklon-B pellets, meaning that the gassing procedure would have taken a long time and would have resulted in psychological torture of the victims. The beauty of the Mauthausen design was that the gassing apparatus was in a separate room behind a wall of a fully functioning shower room. The gas chamber room could be used for both showering and killing. The photo above shows the door on the south wall into the Mauthausen gas chamber on the left and the small gassing apparatus room next to it on the right. There is a wide doorway into the gassing apparatus room which has no door. 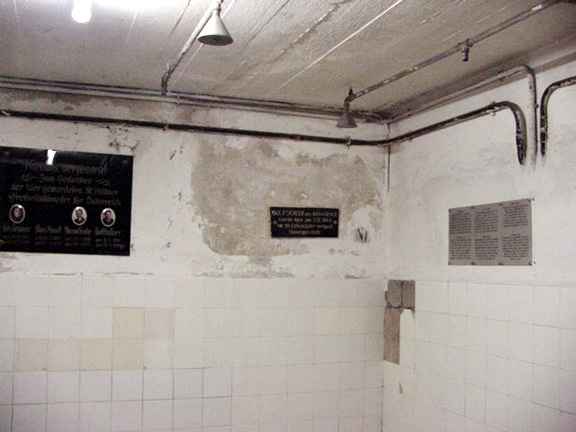 Note the tile on the walls of the apparatus room which is the same kind of tile that is on the wall of the gas chamber. The photo above shows a view of the north wall of the Mauthausen gas chamber. The photo shows what appears to be heating or cooling pipes and what looks like a vent hole in the ceiling in the northwest corner of the room. The gas chamber is underground and above it is the open space between the hospital building and the bunker. 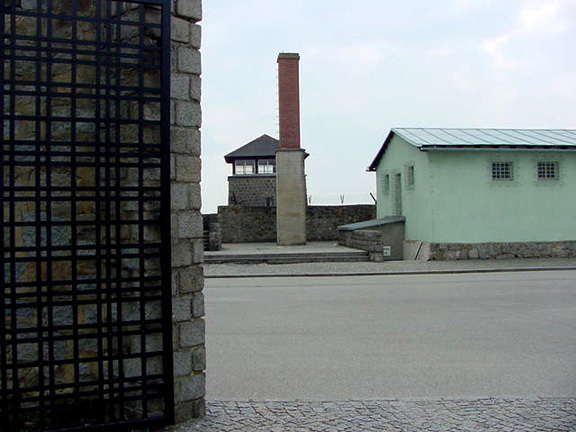 When I visited the Mauthausen Memorial site in May 2003, I saw a sign in the gas chamber which said that the gassing apparatus had been removed on April 29, 1945, which was a few days before the American liberators arrived. Did the stupid Nazis actually remove the evidence and then leave a photo of the gassing apparatus behind? In April 1989, there was a different sign in the Mauthausen gas chamber with slightly different wording. 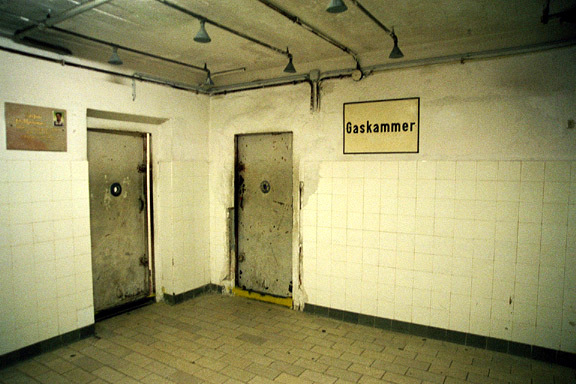 The gas chamber was camouflaged as a bathroom by sham showers and waterpipes. 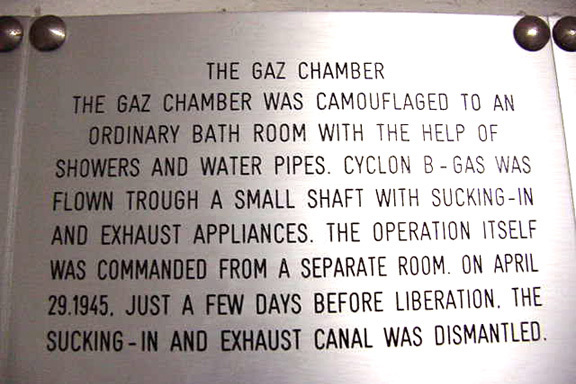 Cyclone B gas was sucked in and exchanged through a shaft (situated in the corner on the right) from the operating room into the gas chamber. The gas-conduit was removed shortly before liberation on April 4th, 1945. Note that, in 1989, the date given for the removal of the gassing apparatus was April 4, 1945. 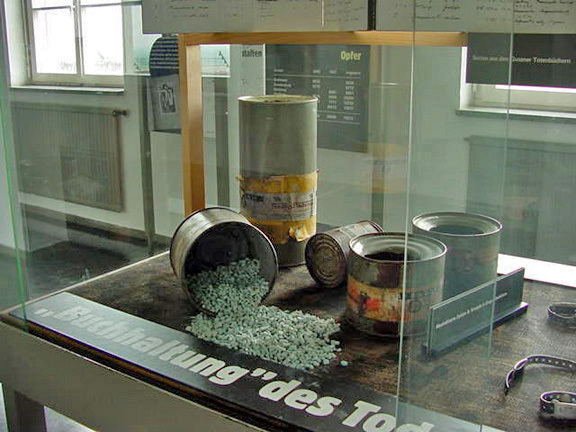 In May 2003, the sign in the gas chamber gave the date of removal as April 29, 1945. I don’t know when the photo, that is in the National Archives, was taken. The Nizkor web site includes information about the trial of Martin Roth, one the Mauthausen SS men in a later court proceeding. When a gassing was to be carried through [….] Roth ordered one of the inmates under his command in the Krematoriumskommando — in most cases the witness Kanduth — to heat up a brick in the oven of the crematorium. Roth carried the hot brick with a shovel into the gassing cell and put it there into the gassing device. This consisted of an iron box with a removable lid, which could be sealed airtight with wing bolts and insulation. The hot brick put inside served the purpose to accelerate the evaporation of the poisonous gas by the rising heat. The gas was introduced later and was bound to bits of paper. In the meantime the victims [….] were led to the changing room of the gassing facility where they had to remove their clothes. 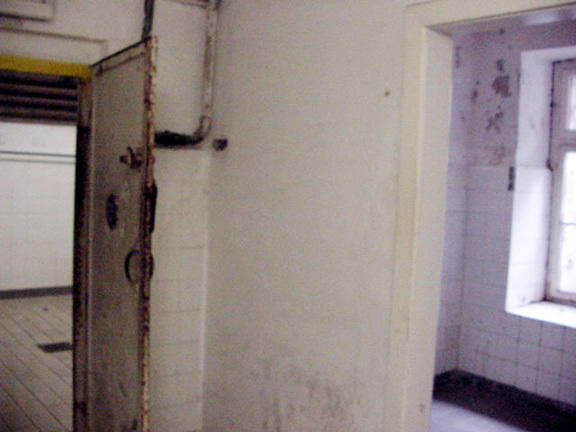 The photo above shows a short hallway with a door into the Mauthausen gas chamber. On the right, one can see the water pipes entering the room. Note the electrical wiring and a light switch on the left. The door has a peep hole so that the gas chamber operator could check to see when all the prisoners were dead. The first photo above shows the south wall of the gas chamber on the right side. This is where the sign, in six languages, about the gas chamber operation is located. Just below the sign, four of the ceramic tiles have been removed, possibly to test them for Zyklon-B residue. The gassing device, which has been removed, was located in a “separate room” behind the south wall. 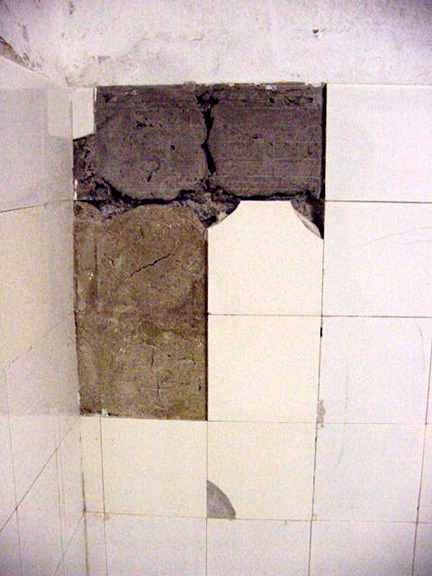 All the tiles have been replaced after the removal of the device and no evidence can be seen today. Before he died, after being shot “while attempting to escape,” Commandant Franz Ziereis confessed to the gassing of prisoners at Mauthausen. The photo below shows the chimney for the crematorium ovens; the gas chamber was located underground to the left of the chimney. The green building on the right is the bunker, which was the camp prison. Across the street, in the foreground, is the gate into the Quarantine camp where incoming prisoners were held for a couple of weeks in an attempt to prevent the typhus epidemics which devastated all the concentration camps. There was no chimney to vent the gas from the gas chamber, as described in the court testimony. 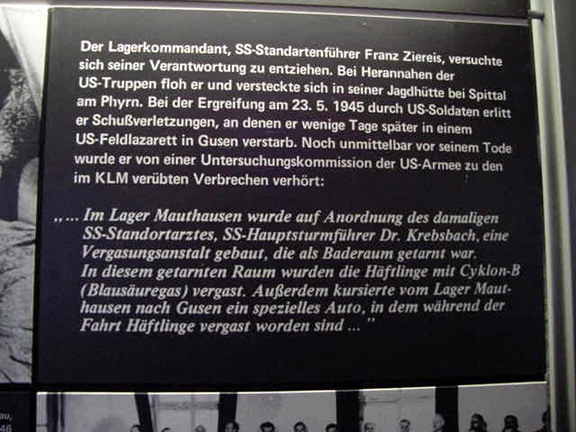 There is a wealth of eye-witness testimony about the Mauthausen gas chamber, which I have collected and put on this page of my scrapbookpages web site, and on this page where Martin Roth and Kanduth, a Kapo at Mauthausen, are mentioned. Why did they remove anything? Please tell me why. And if they were going to conduct mass executions, why was the area about the size of a shower room? Eichmann wasn’t banal. Germans were banal. So who were the engineers actually? This post doesn’t mention any company or engineer names. There is a wealth of information on crematorium ovens made by Topf & Sons. Same apparently for delousing chambers. Books and technical documents. What about for gas chambers? I was curious about that hot brick method too. There seems to be many different methods. Why didn’t they use that Degesch machine for the gas chambers? You have a picture of it from Dachau. This post is getting a lot of hits again for some reason. I decided to read it again so that I can figure out why people might be interested in this subject. I noticed that I neglected to answer your question about “who were the engineers actually?” The whole point of this post is that the names of the gas chamber engineers are unknown. This is really curious because the things that were invented by German engineers are typically named after them. The fact that the Degesh machine was not used at Mauthausen is easily explained. The Mauthausen gas chamber is a shower room. There are real water pipes going into the room and real shower heads. If they had used a Degesh machine in this room, the prisoners would have panicked because they would have realized that this was more than a shower room. The idea was to fool the prisoners into thinking that they were just taking a shower. While doing some paint ovens at Ford plant in KC for Dürr industries. Rumor was that Dürr industries built all that kind of gas chambers and that Bayer supplied the poison gas.clarify that could you. Commandant Max Pauly and 13 staff members were charged with war crimes in the first British military tribunal held in Hamburg between March 18, 1946 and May 13, 1946 for Neuengamme staff members. Eleven of the 14 accused, including Max Pauly, were sentenced to death and were executed on October 8, 1946. Wilhelm Bahr, a medical orderly in the Neuengamme camp, was among those who were convicted and then hanged. He had previously testified for the prosecution in March 1946 at the British trial of Dr. Bruno Tesch, who was accused of supplying Zyklon-B to the Nazi camps for the purpose of gassing the prisoners. Bahr testified that he had used Zyklon-B supplied by Dr. Tesch’s company to gas 200 Russian Prisoners of War at Neuengamme on the orders of Dr. von Bergmann. Hi, The name you are looking for is Siemens. Siemens took slave laborers during the Holocaust and had them help construct the gas chambers that would kill them and their families. Note that the news article does NOT say that the slave laborers, used by the Siemens company, had built the homicidal gas chambers. The problem is do they mean Mauthausen including the Subcamps ( I believe Gusen was such a camp). I just finished reading some of Gitta Sereny’s book, Albert Speer and his battle with Truth, and they mentioned the appalling conditions at Mauthausen. Speer visited the camp during 1943, but said he was given only a superficial view of the nicer parts of the camp. The figures given for the deaths at Mauthausen usually include all the sub-camps, unlike the other camps which give the figures for just the main camp. However, the news reports do not explain this. Gusen started off as a Class III camp, but later became a sub-camp of Mauthausen. I read the book about Albert Speer. Speer played it smart and agreed with the prosecution at Nuremberg that the Nazis were bad; he humbled himself and showed remorse, so he was sentenced to 20 years in prison, while the others were hanged. Of course, he also went along with Gitta Sereny and told her everything that she wanted to hear. He couldn’t tell her that Mauthausen was not that bad. Curiously, Dr. Georg Konrad Morgen, the SS judge who investigated all the camps, didn’t go to Mauthausen, probably because there were no complaints about the SS committing atrocities there. Yes, I have read of this before and I know there were inconsistencies. The Commandant had been tortured and made extravagant claims. I hope they get the history straight, for it’s own sake, but whether they used it or not, the Nazis were particularly cruel at this camp. Mauthausen (and Gusen), both in Austria, were the only Class III camps. Buchenwald was a Class II camp; Dachau, Sachsenhausen and Auschwitz I were Class I camps. The worst criminals, the most dangerous Resistance fighters and the most hard-core Communist political prisoners were sent to Mauthausen. It could be that the Nazis were cruel to these prisoners because they were the worst of the prisoners, or it could be that the Mauthausen prisoners told the worst lies about their treatment in the camp. The death rate at Mauthausen was the highest of all the camps that were not “death camps.” It could be that the inmates were killed because they were the worst prisoners, or it could be that the Mauthausen prisoners told the worst lies. In my opinion, the Mauthausen prisoners were the worst liars. Good answer. It’s kind of ridiculous to talk about how “cruel” the “Nazis” were to prisoners who were some of the most cruel and murderous elements in society. This holo sob-sob stuff becomes beyond belief — every prisoner in a German camp is supposed to be seen as an innocent victim who is being persecuted for religious or political reasons. In truth, the majority, including women, were persons who committed every atrocity against Germans imaginable, if they could get their hands on them. And who destroyed vital property and infrastructure too. There is no common sense to it. Today is the anniversary of the liberation of Mauthausen, and I have been reading the news reports. Every news article says that there were 200,000 prisoners at Mauthausen and half of them were killed.